Kitimat Unifor local 2301 has succeeded in forcing the Environmental Assessment Board (EAB) to take responsibility for investigating the impact of plans for a dramatic increase of sulphur dioxide (SO2) at the Rio Tinto smelter in Kitimat. The BC Supreme Court has sided with Unifor in a judicial review involving the Ministry of Environment’s approval of the smelter’s expansion without a SO2 “scrubber”. The project will increase SO2 emissions from 27 tonnes per day to 42 tonnes per day. The decision to approve the smelter expansion without scrubbers will now be sent back to the EAB. Airborne sulphur dioxide is a well-known cause of respiratory ailments. Excessive SO2 levels in Kitimat are likely already impacting human health. In July 2012 a Community Health Synopsis study published by Northern Health concluded that the incidence of death from bronchitis, emphysema, and asthma is 60 per cent higher in Kitimat than the British Columbian average. Expert evidence known to the Minister of the Environment reveals that increased SO2 can cause serious health problems, including fatal respiratory failure. In the decision, BC Supreme Court Justice W.F. Ehrcke wrote that it was unreasonable for the EAB to conclude that Unifor’s appeal must be rejected on the ground that the 2014 Letter of Approval to Rio Tinto was not an appealable decision within the meaning of the Act. Other challenges to the emissions of sulphur dioxide from the Rio Tinto smelter are continuing. 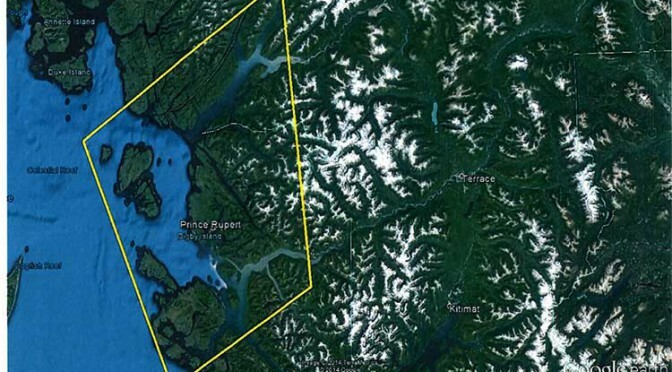 Kitimat can accommodate industrial growth, air shed study says. But where’s Northern Gateway? 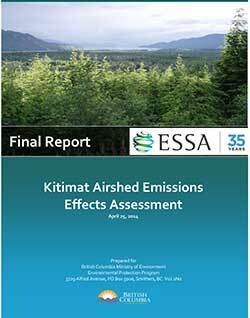 The long awaited Kitimat air shed study, released by the province Friday, July 17, 2014, says “that with proper management, Kitimat’s ai rshed can safely accommodate new industrial growth” without major affects on either human health or the environment. 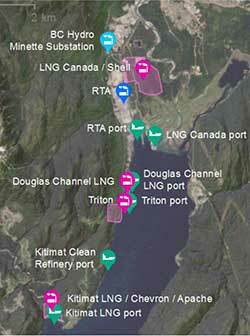 Four proposed LNG facilities; Shell-led LNG Canada, Chevron lead Kitimat LNG, the floating Douglas Channel LNG at the old log dump and a second floating LNG project called Triton. Predicted increased to marine shipping in Douglas Channel. The study was divided into two zones. 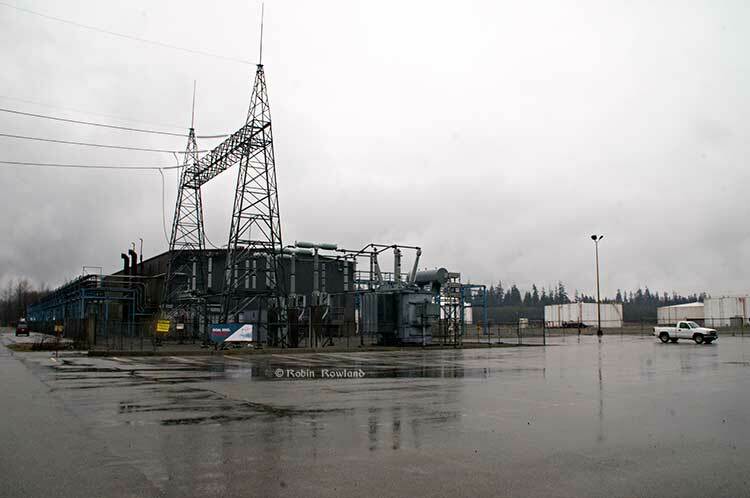 Health results were first examined for Kitimat townsite, the Kitimat Industrial Service Centre and Kitamaat Village. The wider study included Gitga’at Old Town, Hartley Bay (Kulkayu), Kitimat-Stikine, Kitselas, Kitsumkaylum, Kshish, and Terrace. The JRP report acknowledged that emissions from the Enbridge terminal would be minimal but would contribute to the cumulative effect of pollutant emissions from other industries and required Enbridge to consult with the District of Kitimat, the environment ministries and other industries in planning for emissions. 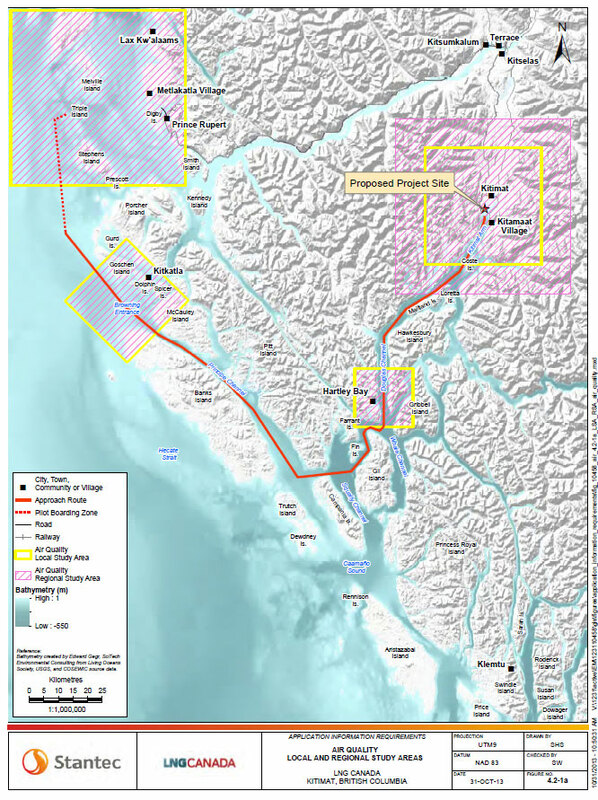 The map from the airshed study also shows that the possible marine terminal for David Black’s proposed Kitimat Clean refinery project is at or close to where the proposed Enbridge Northern Gateway terminal would be. The study looked at proposed emission levels and the effect of emissions elsewhere in the world and then compared those studies with the Kitimat Valley. It found that the risk of sulphur dioxide was “directly related to proximity to industrial area”–largely the Kitimat Service Centre area–and that there would be a minor increase in respiratory incidents of 0.5 per cent to 2 per cent, with a slight increase of nitrogen dioxide but those were within existing guidelines. As for environmental impact, the study says nitrogen dioxide impacts will be low. There wil be “some increased risk of soil impacts” from sulphur dioxide. The study says there will be “no negative impacts to vegetation across all scenarios” but did find “potential for acidification” of seven small lakes. Lakelese Lake is not one of those affected. The study also doesn’t include particulate matter and although it does consider climate change, did not take into consideration possible increase of green house gases in the Kitimat Valley. The consultants, Esssa Technologies of Vancouver, based its findings on an earlier study by Rio Tinto Alcan on emissions from the Kitimat Modernization Project and worked on those findings by adding new industries and a greater area to the models they used. The higher levels of sulphur dioxide emissions from the Rio Tinto Alcan Kitimat Mondernization Project will be allowed to continue under the current permit. Environment Minister Mary Polack told reporters that will only change if the current court challenge to the sulphur dioxide levels are successful. 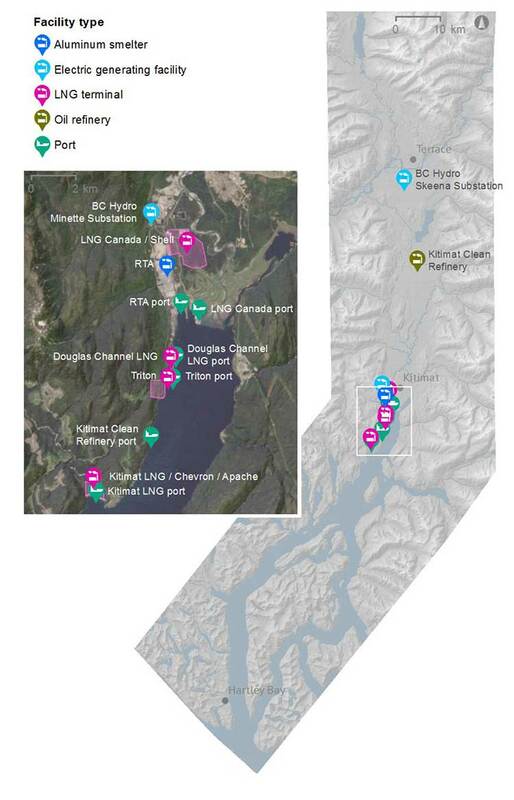 A map by Essa Technologies and Environment BC of the Kitimat valley airshed study shows locations for existing and proposed industrial or infrastructure development. It does not include the proposed Enbridge Northern Gateway project. Among the 209 conditions imposed on the Enbridge Northern Gateway project is No. 82, an Air Quality Emissions Management and Soil Monitoring Plan. j) a summary of discussions with the District of Kitimat and local or regional industrial emitters regarding collaborating on the plan’s design and implementation. One of the things that the Joint Review Panel noted in requiring Enbridge Northern Gateway to have an updated plan and to collaborate with Kitimat and other industries is that levels of acceptable sulphur doixide in the atmosphere are changing and much of Northern Gateway’s modelling was based on standards that were becoming obsolete. Northern Gateway assessed changes in the atmospheric environment, including a modelled assessment of criteria air contaminant, hazardous air pollutant, and greenhouse gas emissions. Criteria air contaminants assessed by modelling included sulphur dioxides, nitrogen oxides, carbon monoxide, hydrogen sulphide, and particulate matter. Hazardous air pollutants were also modelled and included total volatile organic compounds (VOCs), benzene, toluene, ethylbenzene, and xylene (combined, BTEX), as well as hydrogen fluoride. The provincial air shed report considered only two contaminants, sulphur dioxide and nitrogen dioxide. Northern Gateway said there would be minimal atmospheric emissions from the construction and operation of the pipeline. The focus was on the Kitimat marine terminal. 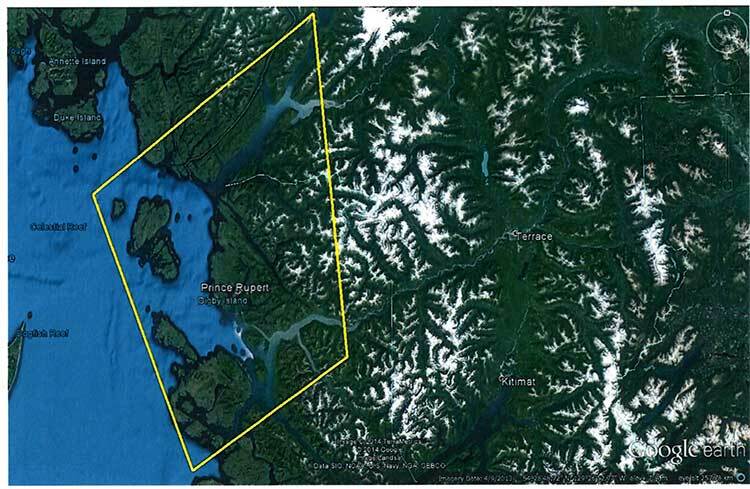 hydrocarbon storage tanks Northern Gateway used the conservative assumption of continuous ship berthing…emission rate) in order to capture the worst case scenario of concurrent adverse meteorology and maximum potential emissions. From the model results, Northern Gateway predicted that sulphur dioxide associated with operating the Kitimat Terminal would exceed the provincial air quality objectives (Level A) for all time periods. This after mitigation. Environment Canada said that Northern Gateway took appropriate measures in designing and siting its proposed facilities to minimize adverse effects on air quality. It acknowledged Northern Gateway’s commitments to adopt best practices and to use economically-feasible best-available technologies in designing the Kitimat Terminal to minimize effects on air quality. marine vessels, the highest concentrations were predicted to occur infrequently and immediately adjacent to the terminal fence line. Northern Gateway, Transport Canada, the Heiltsuk First Nation and other stakeholders did acknowledge that eventually the vessels coming to Kitimat “would be subject to the reduced sulphur fuel requirements associated with the joint United States-Canada North American Emission Control Area. Based on this, marine fuel sulphur requirements permitted in Canadian coastal waters (200-nautical-mile limit) would be 1.0 per cent in 2012, reducing further to 0.1 per cent by 2015. Northern Gateway predicted that sulphur dioxide emissions from marine vessels should be approximately 96 per cent lower than modelled once these new international fuel standards take effect. Northern Gateway also predicted exceedances of provincial air quality objectives in the area for carbon monoxide, particulate matter, hydrogen sulphide, and total reduced sulphur. Northern Gateway said there “no exceedances of hazardous air pollutant guidelines were predicted as a result of the project itself” but there could be a cumulative effect with other industries in the Kitimat waterfront. 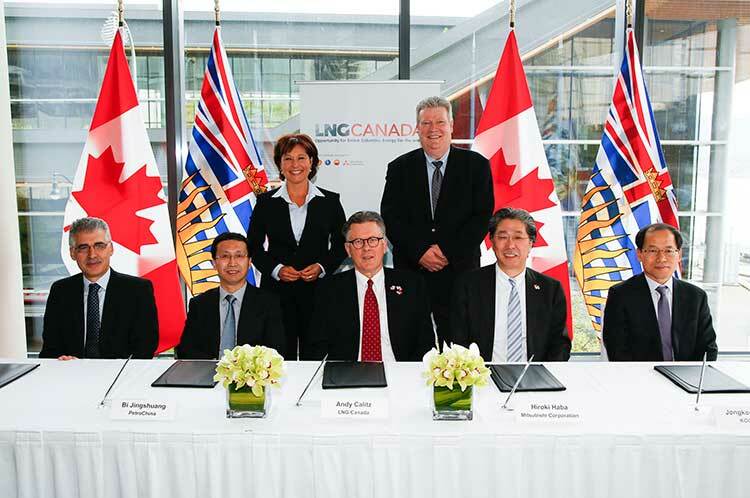 the provincial emission inventory of 2000 was compiled, and since Northern Gateway completed its modelling assessment. Regarding the sulphur emissions attributable to the terminal, marine vessel berthing would account for 97 per cent. Given that Northern Gateway used conservative assumptions regarding berthing in the modelling and that regulations coming into force regarding the sulphur content of marine fuels would further decrease predicted missions, the Panel finds that the modelling results presented in the application and subsequent filings are not predictive of the realistic potential effects on local air quality. Based on the filed information about sulphur dioxide emissions, the Panel is satisfied that new modelling based on the updated information would indicate that sulphur dioxide associated with the Kitimat Terminal’s operations would not exceed provincial air quality objectives. The Panel requires that further modelling, reflecting the current level of activity, equipment, and marine sources, must inform Northern Gateway’s design of the Air Quality Emissions Management and Soil Monitoring Plan for the Kitimat Terminal. Updated modelling would be used to inform the monitoring program’s design, as well as to help ensure that the monitors are placed effectively to monitor both human and environmental health. Northern Gateway said that, during the Kitimat Terminal’s operations, tank maintenance and marine berthing would add a potential measureable contribution to regional cumulative environmental effects from air emissions. 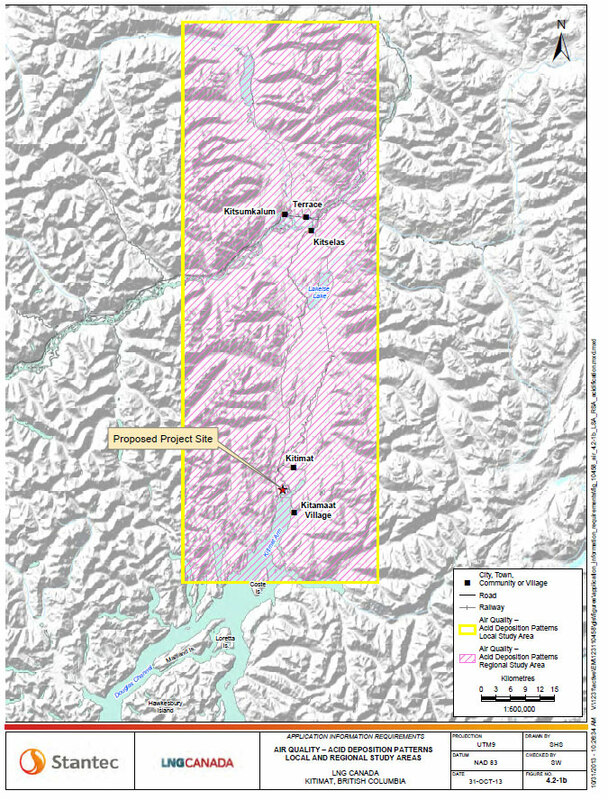 Northern Gateway incorporated the existing industrial sources in the Kitimat area in its modelling assessment, using the British Columbia Ministry of Environment’s emissions inventory. At the time the modelling was run, the available emission estimates from 2000 were used to characterize the existing sources in the airshed. Combining these with the predicted project emissions, the model results indicated predicted exceedances of regulatory thresholds for sulphur dioxide, carbon monoxide, particulate matter, hydrogen sulphide, and total reduced sulfur, though not at every averaging period. Northern Gateway said that, due to the existing large emission sources and the region’s complex meteorology and topography, the exceedances are primarily attributable to the other industrial activities around Kitimat and not from the project itself. Because there would be adverse project effects remaining after mitigation that could combine with the effects of other past, present, and future projects, and because cumulative effects are of primary concern, the Panel’s significance recommendation is given below in its analysis of cumulative effects. 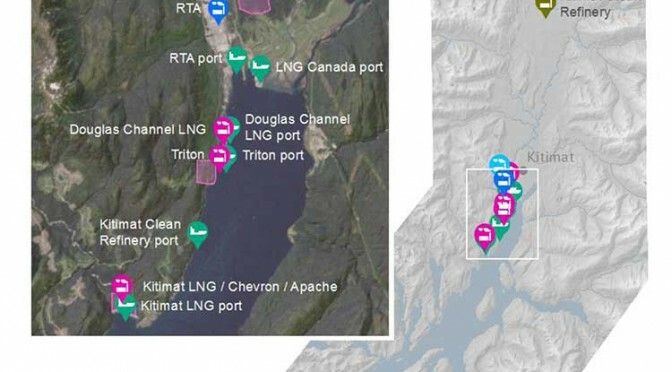 The Panel finds that the emissions associated with the Kitimat Terminal’s operation would be minimal compared to the existing sources presented. Although the modelled cumulative emissions exceeded many regulatory thresholds, the exceedances were predicted based on an out-of-date emissions inventory, and were predicted to occur prior to adding emissions from the project. Based on the information about sulphur dioxide emissions on the record, in addition to the modelling included in the application, the Panel is satisfied that new modelling based on updated information would indicate that sulphur dioxide associated with the Kitimat Terminal’s operations would not contribute to an increased exceedance of provincial air quality objectives, either through limited emissions or berthing management to limit emissions in particularly adverse conditions.